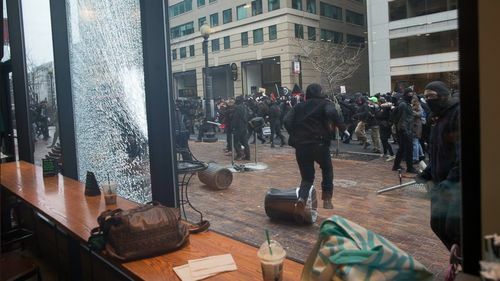 Anti-Trump protesters hurl rocks and other debris at a Starbucks window as they run through the streets in Washington DC. President Donald Trump and First Lady Melania Trump arrive and take their seats at the inaugural luncheon at the U.S. Capitol. Earlier during the inauguration ceremony, supporters react as President-elect Donald Trump appears for his inauguration at the U.S. Capitol. 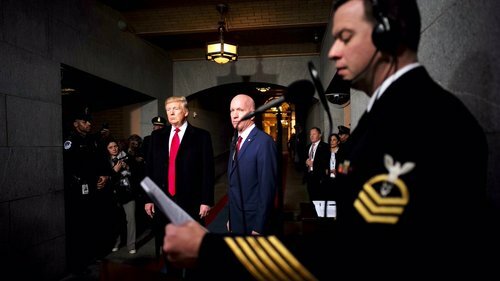 Donald Trump was officially sworn in as the 45th president of the United States at the Capitol today, and leaders from around the world offered well wishes and congratulations to America's new commander in chief. Israeli Prime Minister Benjamin Netanyahu tweeted his congratulations to his "friend." Congrats to my friend President Trump. Look fwd to working closely with you to make the alliance between Israel&USA stronger than ever ???????????????? 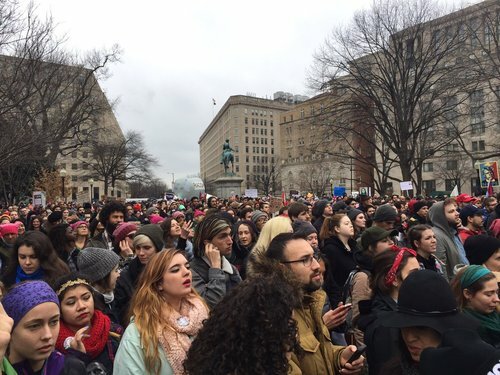 Police use pepper spray on protesters in Washington DC, just blocks from Donald Trump's inauguration at the Capitol. 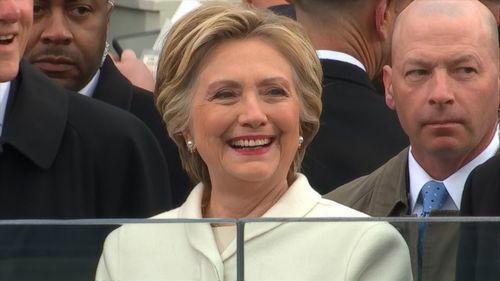 At the inaugural luncheon, President Donald Trump shook Hillary Clinton's hand and thanked her. This is the first face-to-face encounter between the two since the election. 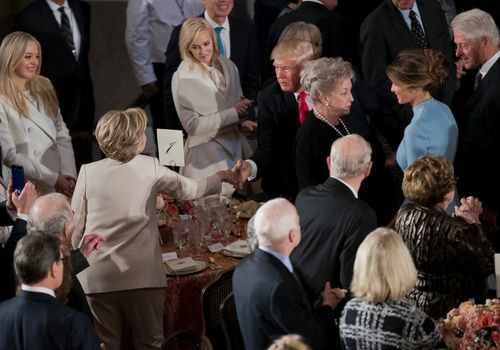 Trump shook hands with Clinton at the Al Smith Dinner in New York City in October 2016. 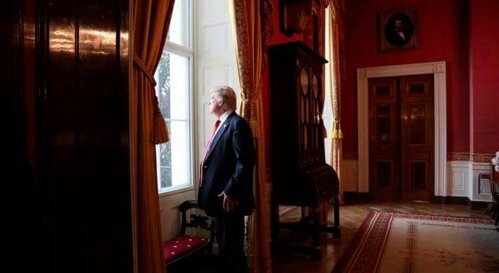 President Donald Trump posted this picture to Facebook of him peering out a window in the White House's Red Room. 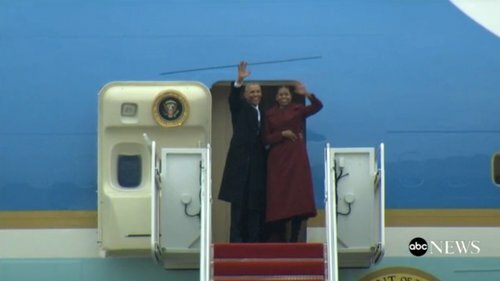 Before departing, the former first couple -- both clearly emotional -- had a final farewell with former White House staff gathered in an airplane hanger at Joint Base Andrews. The former president offered encouragement to his staff, saying "this is just a little pit stop." "This is just a little pit stop. This is not a period, this is a comma in the continuing story of building America," Obama said to former staffers. "I could not be prouder of you," Obama said to his staffers.This has been the privilege of my life and I know I speak for Michelle as well." "Yes we did, yes we can," he said, ending his remarks. The former first couple spent a good amount of time shaking hands with former staffers gathered in the hanger before boarding the plane. 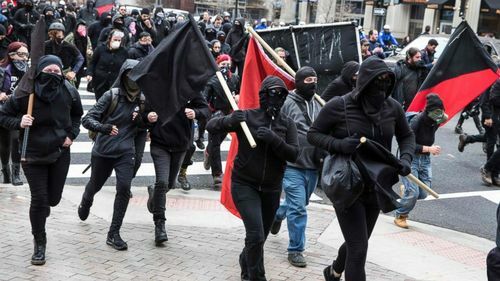 Violence flared on some streets of Washington, D.C, today as at least some members of a group dressed head to toe in black allegedly smashed the windows of cars and store windows shortly before President Donald Trump took the oath of office. The city's Metropolitan Police Department said it made numerous arrests following the alleged vandalism. 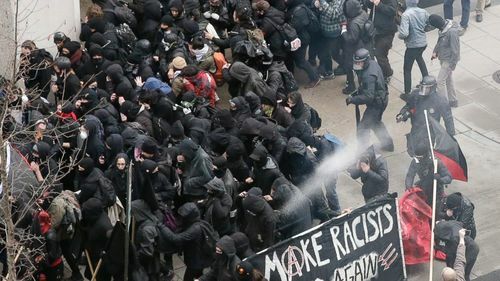 Police said an organized group marched through the northwest part of the city at around 10:30 a.m., and that "members of the group acting in a concerted effort engaged in acts of vandalism and several instances of destruction of property." 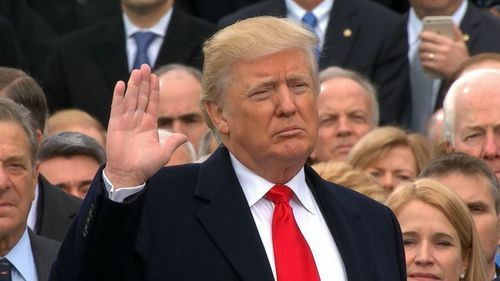 ABC NewsChief Justice John Roberts administers the presidential oath of office to Donald J. Trump. 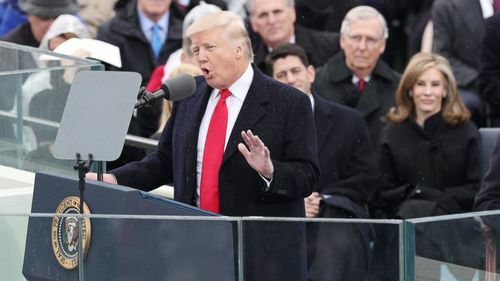 The Tweet includes a link to Trump's inaugural speech. Trump is also continuing to use his personal account he's used for years. The D.C. Metropolitan Police Department confirms to ABC News that at least 95 arrests have been made. DC police chief says "we will get it under control." Small group of about 200 making scenes and they will be "held accountable." At the inaugural luncheon, Sen. Chuck Schumer presented President Donald Trump with photographs of his inauguration. Paul Ryan toasts Pence: "May you have every blessing and success as the 48th Vice President of the United States. Sláinte!" 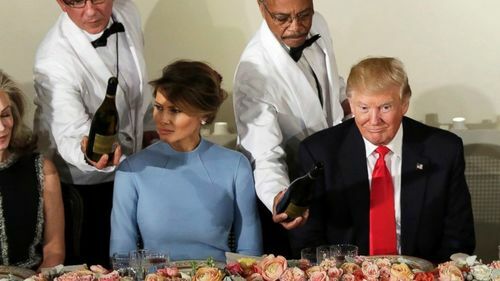 Donald Trump at the inaugural luncheon: "I was very honored, very, very honored, when I heard that President Bill Clinton and Secretary Hillary Clinton was coming today, and I think it's appropriate to say and I'd like you to stand up." Dozens of Democratic members of Congress skipped Donald Trump's inauguration this Friday. While some of the 67 made their decision in previous weeks, many more have came forward in recent days, citing the president-elect's perceived insult of Rep. John Lewis as the final straw. 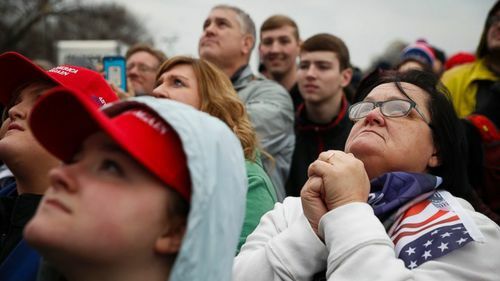 A divided nation on edge greeted a new president on Friday. Yet the America he’s putting first is not united, and not particularly optimistic. The new president’s portrait of America was similar to the one he embraced as a candidate, with little adjustment for the fact that he is now president. President Trump and Vice President Pence will conduct a military review at the east front of the U.S. Capitol. The world's eyes are on Washington today as Donald Trump is sworn into office as the 45th president of the United States. From Buenos Aires to Berlin, Trump's likeness can be seen on the front page of newspapers from every corner of the globe. Some express fear, others express hope. But all will be looking to see how the incoming administration will wield U.S. influence across the world. President Donald Trump and first lady Melania attend the Inaugural luncheon at the National Statuary Hall in Washington, Jan. 20, 2017. Within hours of Donald Trump becoming the 45th president of the United States, his new administration has already announced its commitment to eliminate the Climate Action Plan, according to a posting on the White House's official website. President Trump and Vice President Pence will then join the inaugural parade down Pennsylvania Avenue from the Capitol to the White House, leading the procession of over 8,000. Veterans and active members of the military, high school and college bands, police, motorcycle and cavalry units, and the Boy Scouts of America are a few of the parade participants. President Jimmy Carter was the first president to walk in the inaugural parade and since then, presidents have ridden in limos and walked part of the parade route. 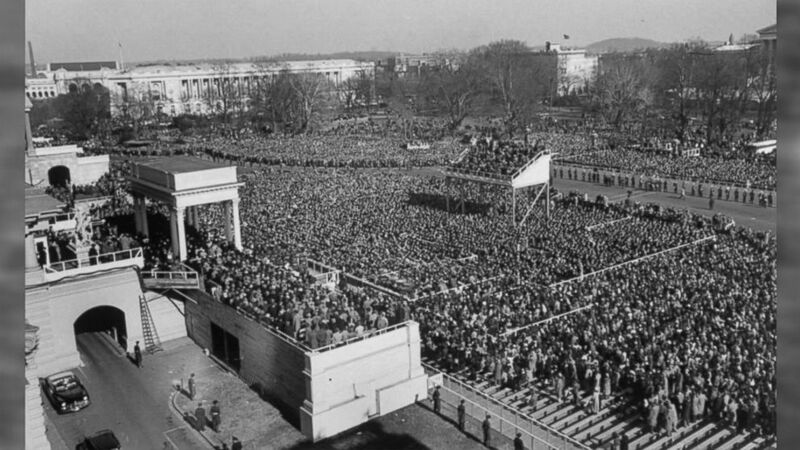 Throughout history, people have flocked to the National Mall to see the next president of the United States be sworn into office on Inauguration Day. The first organized parade was for James Madison in 1809, but before that there were presidential processions. Local militias accompanied George Washington in his trip from Mount Vernon in Virginia to New York City for his first inauguration ceremony in 1789. The only parade known to have been canceled because of the weather was Ronald Reagan's second in 1985. It was the coldest Inauguration Day to date. The noon temperature was 7 degrees Fahrenheit, but the wind chill temperatures were in the negatives. The freezing temperatures made proceeding with the parade dangerous. Even when there was a blizzard for William Taft’s inauguration in 1901, the parade was not canceled. Workers had to clear snow from the parade route. The largest parade -- and the longest -- was held for Dwight D. Eisenhower's first Inauguration in 1953. 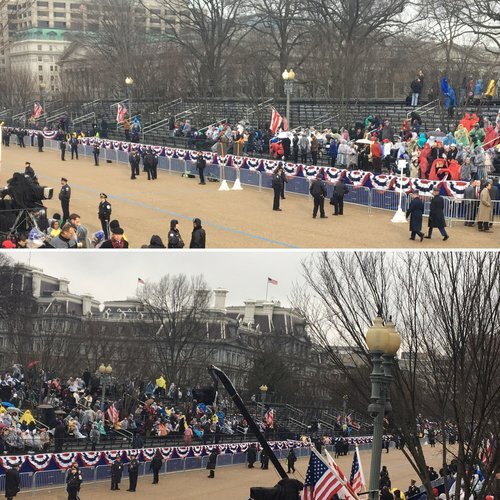 The parade featured 73 bands, 59 floats, horses, elephants and civilian and military vehicles in a procession lasted 4 hours and 32 minutes.